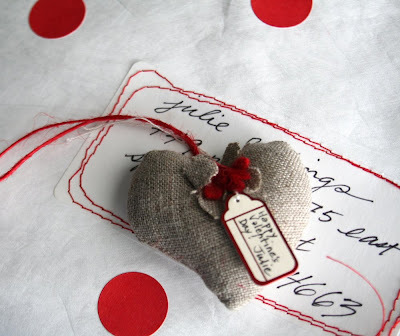 Julie - LOVE LOVE LOVE these wonderful heart ideas. I so agree with you - vintage velvet is dreamy to the touch - I have a few remnant pieces but in salmon and navy --- little harder to be imaginative with. Oh Julie, these are so wonderful. 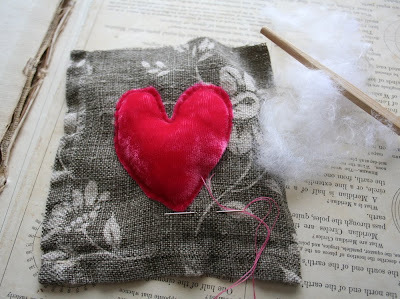 I adore the red velvet heart against that pretty grey fabric. Divine! I love everything here, Julie. And I love YOUR heart for sharing these techniques with us. Thank you. Love, love love that heart! Sigh, I love them all. This post is dreamy, it is amazing. the photographs are beautiful, and the velvet heart is just well better than chocolate truffles. 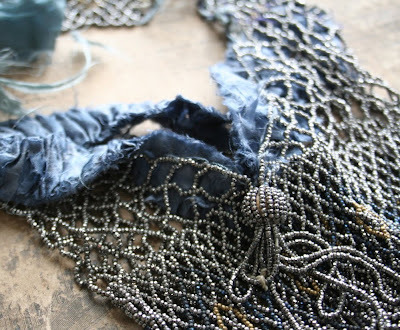 Oh Julie, you have me wanting to go play with all my vintage fabrics! This seems like such a simple project but would yield heavenly rewards! So incredibly fun...I was so glad to see your post here. I check daily! Vintage silk velvet almost makes me cry! 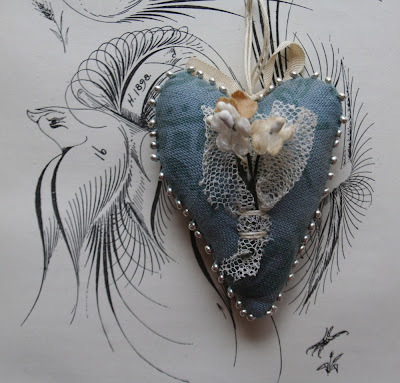 Absolutely wonderful....I must make one. I sure would like to find a vintage velvet dress! 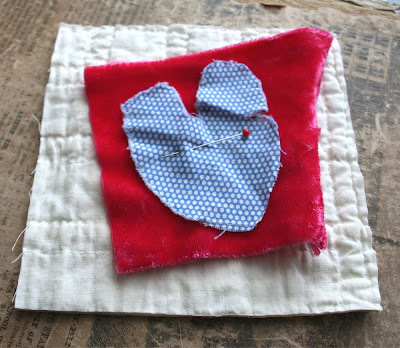 I love your hearts Julie- they are so pretty. 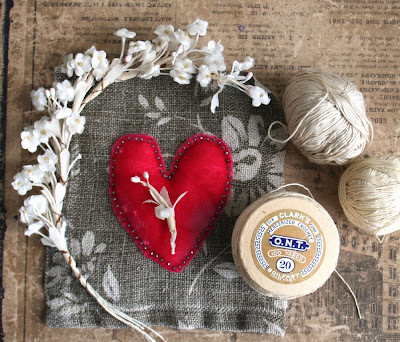 I wish you would put some of these pretties on your etsy. your tutorials and pics are just so awesome. Thanks for sharing. Your creations just blow me away. I am in love with every picture on this post! Thank you again for sharing these pictures and projects. Off to find velvet . . .
Aww! This is so, so sweet! Thanks so much for this, I'll be linking. That velvet looks wonderful - I can just imagine how relaxing it must have been to sit there and stitch it. Really beautiful! 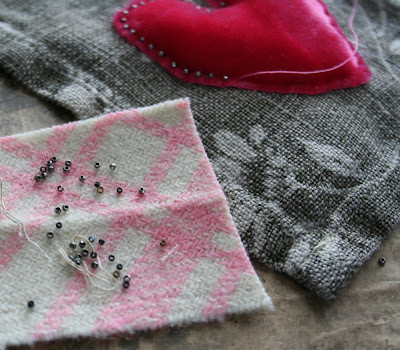 Another great project - you've got me wanting to head out in search of vintage clothing now. Those are absolutely adorable. Thank you for sharing. 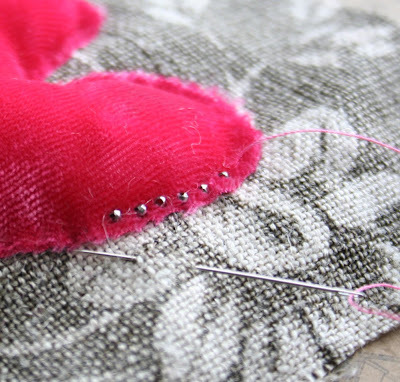 One question, for the first heart, did you chain stitch those silver beads around it? 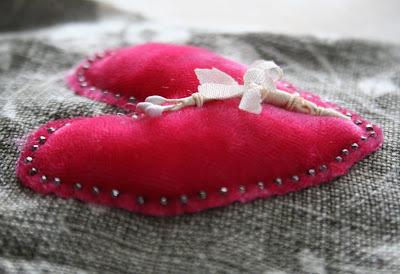 Lovely sweet stuffed hearts...they have stolen my heart...I am going to make one as soon as possible. 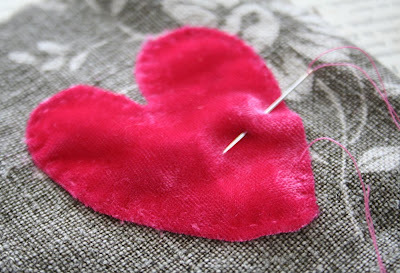 Oh so sweet that heart is! Julie, I amsooo tickled-pink to have your blog!!! If I've said this before plz pardon my giddiness!!really. ooo your hearts are precious, each one so very lovely! Julie! Thanks for posting a pic of my package and heart. I am in love with your beautiful hearts! So lovely!